Starting next summer electric buses will join the VTA fleet. 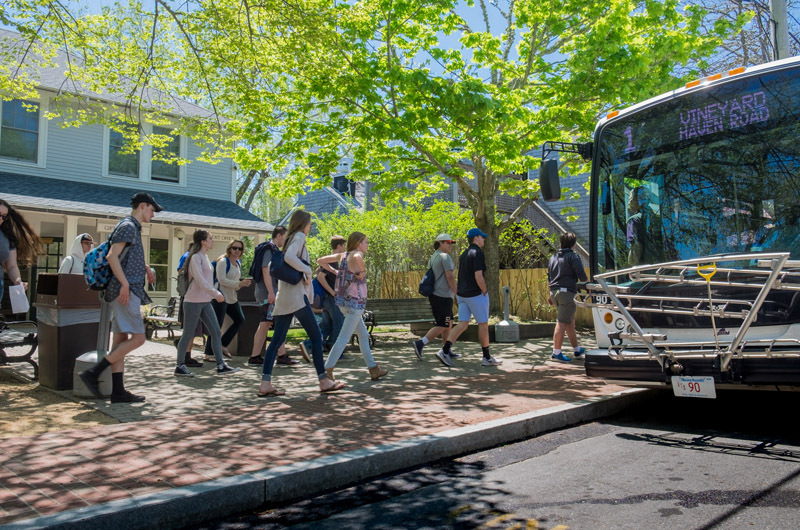 The Vineyard Transit Authority has received a $1.2 million federal grant to move forward with a project to add electric buses to its fleet. The competitive grant from the Federal Transit Authority will help the transit authority purchase two additional electric buses and an energy storage system in addition to four electric buses that were already on the way, according to VTA administrator Angela Grant. The grant program awards funding for the purchase of zero-emission or low-emission transit buses and related costs. The VTA has also received a $1.4 million local match from the MassDOT Regional Transit Authority Capital Asset Program. In January the VTA first announced plans to start transitioning from clean diesel buses to electric buses. In addition to reduced emissions, Ms. Grant said, electric buses will be quieter and more reliable than diesel buses. Four electric buses will arrive on the Island next June, with another two arriving in August, Ms. Grant said. The new buses require significant training for operators and will be rolled out slowly over the summer. As electric buses are introduced, she said, some of the VTA’s fleet of 32 diesel buses will be retired. A 35-foot electric bus is about $750,000, Ms. Grant said, compared to $425,000 for a 35-foot diesel bus like the ones now used by the VTA. She said the VTA does not anticipate fare increases related to the transition to electric buses. The federal grant will also help pay for the infrastructure involved with switching over to electric vehicles, she said. This includes an energy storage system installed at VTA headquarters. The system consists of a bank of batteries that can be charged through the grid during non-demand times. Ultimately a solar canopy will also be installed to create backup power to charge the vehicles, Ms. Grant said. She said the storage system will be in place by the end of 2018, while the solar canopy will go out to bid this year and will take about 18 months to complete. This is welcome news. Conversion to electric vehicles is a key step toward a renewable energy powered island. Congratulations to the VTA for their leadership! I love this! Electricity is the future of energy. Electric vehicles have fewer moving parts and brush-less electric motors require almost no maintenance. To the future MV! Thank you VTA for your vision, and fiscal (TCO) and environmental conservatism! I’ve been driving an EV Nissan LEAF for 4 years with rooftop photovoltaics and it has been revolutionary experience. Glad you are at the front end of this movement. Electric Vehicles (EVs) are NOT the future. They are here NOW, and we will all be transitioning to them as our currently polluting cars age and fail. I've had a Volkswagen e-Golf for 18 months now and would never buy another internal combustion engine (ICE) vehicle again. The drivers (and passengers) will love them. Congratulations to the VTA for it's forward thinking, and helping us all reduce our collective carbon footprint. Does anyone know how much VTA pays per kilowatt hour for electricity? Excellent news. The reduction in noise alone is worth it. I hope these buses are used on the route 13 line which goes through the most populated areas where noise is of the most concern. I believe the VTA can also cut cost and emissions by limiting the size of the busses. The West Chop bus runs every hour through town and 95% of the time its COMPLETELY empty!